Just as a bold frame draws attention to the picture within, your eyelashes frame the natural beauty of your eyes. While mascara creates a thickening and lengthening effect and curlers give your lashes a little lift, cosmetic methods only go so far -- the most striking lashes start with a naturally thick and long foundation. It takes a multi-pronged approach to encourage healthy eyelashes, from tweaking your diet to adding new products to your eyelash arsenal. Remove any eyelash makeup completely with gentle makeup wipes every day. Leaving your makeup on smothers your lashes and may even lead to an eye infection. Let your lashes breath every night to encourage growth. Increase your intake of hair-healthy foods, such as eggs, nuts, cold-water fish, seeds, soybeans, and fruits and veggies rich in vitamins A and C. In addition to vitamins, foods such as these pack plenty of protein and essential fatty acids, which bolster hair growth and quality. Likewise, iron-rich foods, such as leafy green vegetables and chicken, keep hair follicles healthy and help prevent your lashes from shedding. 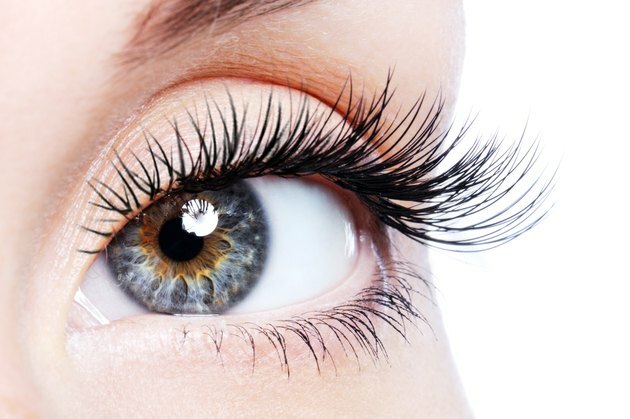 Apply a lash conditioner to your eyelashes twice per day to encourage thickness. These products -- which typically contain natural plant extracts -- come in small bottles with applicator wands, so you can apply them just like you apply mascara. Use the conditioner in the morning -- it works as a primer if you apply mascara afterward -- and before going to sleep at night. Alternatively, choose a mascara that contains lash conditioner. Consult your doctor or dermatologist about eyelash-enhancing topical solutions. Available by prescription, these products -- which often come in the form of bimatoprost ophthalmic solutions, just like the eye drops used to treat glaucoma -- gradually increase lash length, fullness and volume over the course of a few months. Go easy with the eyelash curler. Clamping too hard or holding on to your lashes for more than 20 seconds at a time can lead to damaged lashes. In some cases, eyelash-enhancing topical solutions may lead to eyelid darkening or a change in your eye's pigmentation, especially if you have light-colored eyes. Never use these products without a prescription, and always read and follow and directions or warnings provided by the manufacturer.